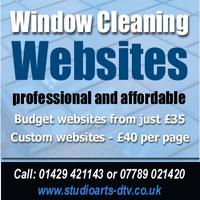 Heritage Window Cleaning based in Hartlepool offer a window cleaning and exterior cleaning service in areas throughout the North-East including Billingham, Hartlepool, Peterlee, Ingleby Barwick, Wynyard, Elwick, Hart village, Northallerton and surrounding areas. As well as cleaning windows they also provide other related services including conservatory roof cleaning, UPVC fascias, soffits and gutter cleaning. Heritage Window Cleaning are fully insured and a member of the BWCA.